'The Year I Was Peter The Great': Marvin Kalb As A Young American In Soviet Russia Marvin Kalb's new book is about a very interesting year — 1956 — that he spent on a diplomatic mission to what was then the U.S.S.R. It's part memoir, part context for understanding the Cold War. Marvin Kalb driving near St. Basil's Cathedral in Moscow's Red Square. 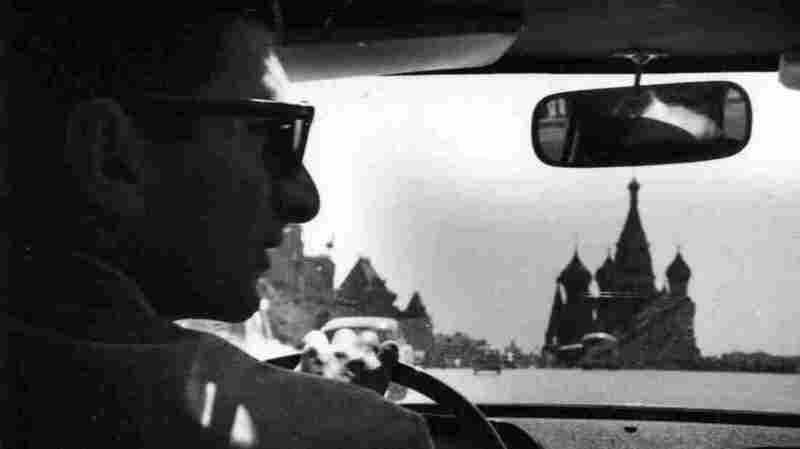 Kalb was a graduate student doing research in Moscow as part of the U.S. diplomatic mission to what was then the Soviet Union. A decade after World War II, the Cold War was well underway. Josef Stalin had died three years prior, and his successor, Nikita Khrushchev, had just given a supposedly secret speech denouncing Stalin — who up to that point had been worshiped as a great wartime leader and modernizer. Eventually, most of the country found out at least part of what he'd said. Kalb says the impact of the speech was so enormous that "people were seen in the auditorium taking nitroglycerin tablets. Some of them literally passed out. A number of them, when they got back to their hotel rooms, committed suicide because they were all associated with Stalin." But the thing that struck Kalb was the impact on the Russian people. "All of their lives, historically, they had never had a feeling of personal freedom. Everything was vested in the power of the vozhd, the great leader." Everything was very quiet, and suddenly one young man got up, and speaking — not in a loud voice — began to say what Khrushchev had said against Stalin and then said "But why doesn't that apply to Khrushchev himself?" And there was a gasp, literally, you could hear a gasp. And then another person would stand up, and then a third, and then a fifth. Suddenly the entire room of hundreds of kids throwing copies of Pravda on the floor, denouncing communism, denouncing Stalin, of course, that was now acceptable but also denouncing Khrushchev. I would go back night after night, and three out of five nights, it was a repeat performance, and what was remarkable, the police never intervened. So they must have got the word from on high that it was alright for these kids to denounce even Khrushchev. 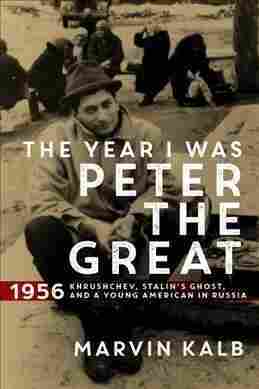 On the party that led to Khrushchev nicknaming Kalb "Peter The Great"
At the time, I still am sort of, [I was] 6'3, thin, and I had been in the United States Army. And I rose to the illustrious rank of P.F.C. — private first class — and the ambassador [Charles "Chip" Bohlen] says to me, you are going to have to look after marshal Georgy Zhukov, the great hero of the Battle of Stalingrad — the defense minister of the Soviet Union, the man who deals with nuclear weapons. And so the night before, I read up everything I could ... on Zhukov and what I found out there was terribly important to me the next day, was that he drank a lot of vodka. He arrives, I am introduced to him, and I begin to ask him questions about Stalingrad. He loved to talk about it. Meanwhile, Tang, the butler of the ambassador whom I had briefed the day before, had a tray set up especially so that one corner of it was filled with vodka, the other quarter with water, but they all looked alike. Tang set it up so that every time the marshal reached for a drink, he invariably got vodka and I invariably got water. After about 40 minutes, he was getting a bit tipsy, and so he grabbed me by the arm and walked me toward Nikita Khrushchev and he said "Nikita Sergeyevich, I have finally found a young American who can drink like a Russian." Well, Khrushchev absolutely loved that line, and he looked up at me and he said "Young man, how tall are you?" I said, "I'm six centimeters shorter than Peter the Great." He began to laugh, everybody began to laugh, and from that moment on, even when I came back to Moscow for CBS, I was Peter the Great. That meant I could get close to Khrushchev when other reporters couldn't, and that was the power of the Russian czar, Peter the Great. That was one of those disappointing moments in my life, and I think in anybody's who had spent any time in Russia in 1956. This thing called "The Thaw," the way in which Khrushchev's attack on Stalin had the effect of liberalizing the society. It not only liberalized Soviet society, it liberalized the entire satellite world in Eastern Europe, and the effect was starting in Poland, and then going on to Czechoslovakia, and going on to Hungary, and there the Hungarian people went all the way. They wanted their freedom, which meant to them that they were able to vote, they could vote whom they wanted, they could have two parties, and they wanted to be independent of the Soviet Union. ... what the Russian people have learned in the last 50, 60 years, now with Putin ... they're happy with having a strong leader, but back in their minds is the memory of 1956. Khrushchev, then, had a crucial decision. He could crack down on the Hungarian Revolution and end it, no matter how bloody that would have been, but he would have retained his personal power or he could have said to the Hungarians "Go your own way. Have freedom," and what he did at the end of the year was not only re-embrace Stalin, but crack down and crush mercilessly the people who had risen to the promise of freedom that he himself had set loose. And what the Russian people have learned in the last 50, 60 years, now with Putin, they live with their powerful vozhd, and they're happy with having a strong leader, but back in their minds is the memory of 1956, and what Putin is doing right now is saying "You Russians can have as much freedom as you like. You can talk about anything you like in your kitchen, in your bedroom, with the pillows over your head. I don't care about any of that, but you will never talk against me." And that's the power that he still retains. This story was produced for radio by Melissa Gray and Emily Kopp, and adapted for the Web by Sydnee Monday and Petra Mayer.